Become a Professional Hair Stylist! I have already started on my units, and I have already learned so much additional information I didn't start with. I can't wait to go further and even expand my courses. With help from celebrity makeup artist Nathan Johnson, professional hair stylist to the stars Laurie Vukich will walk you through every step of numerous hair styling techniques. You will learn a variety of skills from the basics of braiding to creating elaborate pin curls. Put your knowledge to work by completing a series of hands-on assignments. Download a Course Preview to get an inside look at the Hair Styling Essentials Course. 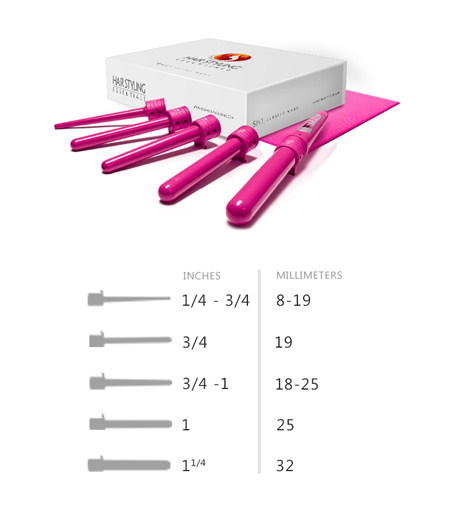 You’ll receive a FREE starter kit that includes a curling wand with 5 interchangeable barrels of varying widths and a heat-proof silicon mat for resting your wand on between curls. Use your starter kit for your assignments and in your professional career! Before making my decision to enroll at QC I decided to email the school to ease a few of my worries. After receiving a lovely prompt response back I knew that I was about to make the right decision. I received all my course material in the mail in just a few days and was all set to begin my journey. The student portal is a great tool for all the information you will ever need while studying, and the staff is amazing in assisting you with any query. Most hair styling students are also certified makeup artists. 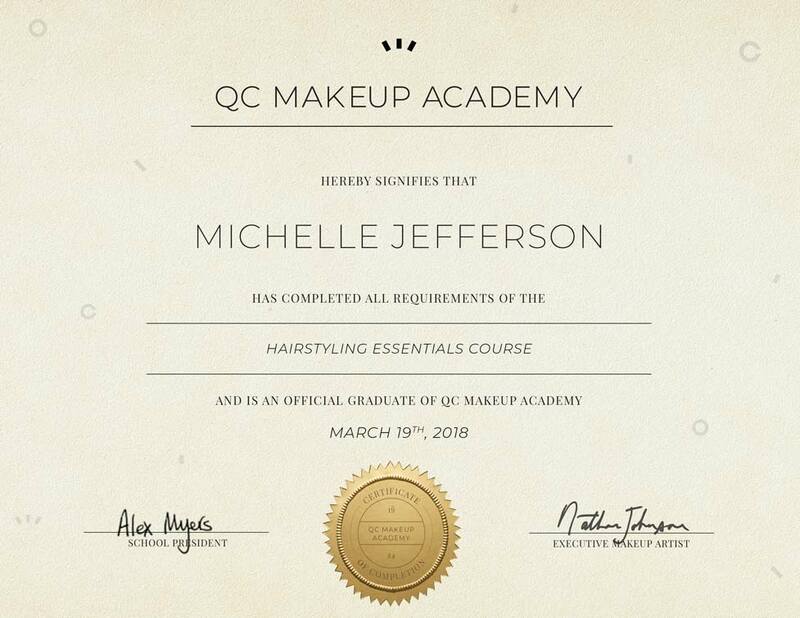 Hair Styling Essentials students and graduates can benefit from many exclusive makeup discounts offered by QC’s preferred makeup and hair partners. Get the best products on the market to build your professional kit! With over 25 years of experience, celebrity makeup artist and hair stylist Laurie Vukich is your instructor for the Hair Styling Essentials Course! Demonstrating professional hair styling techniques, she will take you through step-by-step tutorials for creating a variety of hair styles from 1880s period styles to modern bridal updos. She will also offer expert insights into working as a professional hair stylist. As a QC student, you will be assigned a personal tutor who will provide you with individualized feedback on everything from assignments to career advice. Benefit from a one-on-one learning experience unmatched by any online or in-class hair styling school. Read more about Nathan Johnson and other QC tutors. I've just started, but I have to say the materials and videos are excellent and full of details. You can even watch it anytime and anywhere. I can't wait to finish Master Makeup Artistry and the Hair Styling course. I'm addicted to QC….I will do more once I finish. Nathan & Laurie are amazing on all the videos! Upon graduation, you will receive your Hair Styling Essentials certificate. This certification shows clients that you are an educated, trained professional. As with any job, a certificate alone will not guarantee your success. However, it is a testament to your professional education. Employers and clients are more likely to regard you as a well-rounded and highly knowledgeable hair stylist. QC graduates of the Hair Styling Essentials course have gone on to run their own successful freelance hair styling businesses. Loving QC Academy! Just submitted my final unit in Master Makeup and still getting through Hair Styling, Airbrush, and then onto Pro Makeup. I've already started getting clients and am booked up 3 weeks in advance!... 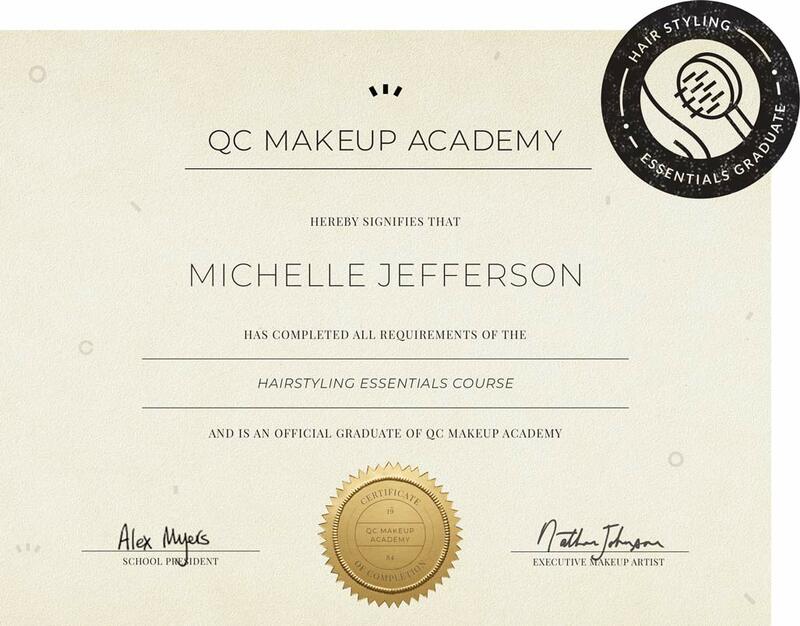 None of this would have been possible without QC Academy, and I've only been doing the course a couple of months! Start Your Hair Styling Career Today! 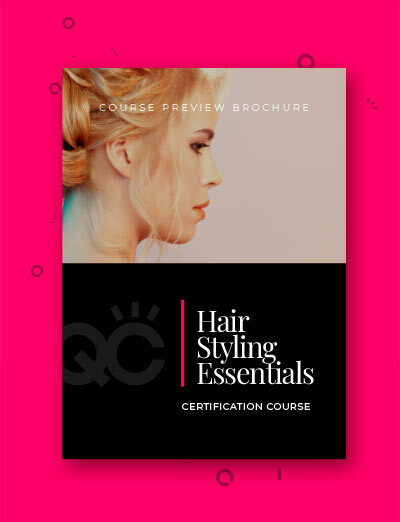 Enroll in QC’s Hair Styling Essentials course and begin learning advanced styling techniques!